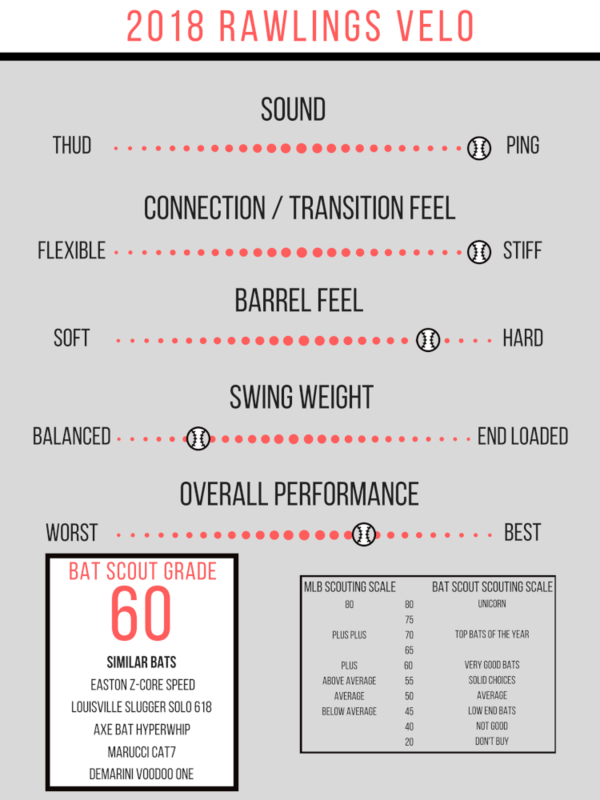 The 2018 Rawlings Velo has been one of the top choices for hitters due to its solid performance and extremely low swing weight. Their Comp Lite end cap has a lot to do with that low MOI (moment of inertia). The Velo is starting to cement its place in bat history as being one of the go to choices if you’re looking for a one piece aluminum bat. Known for its blistering ping, you usually know when a guy is swinging one, even from three fields over, which is the way Rawlings likes it. We will go ahead and tell you upfront that the 2018 Velo is pretty much a carryover from 2017, but it has new cosmetics. If you’re ballin’ on a budget, you may want to check out the 2017 version that should be on sale. The Velo uses a traditional round knob without any deviations in it. The grip, which was introduced last year, is pretty firm compared to a lot of others on the market and uses a repeating pattern. The shapes are indented, which provides a ton of different grip points for your fingers, which is really nice. The handle taper, like the grip, is pretty hard and does not have much cushion to it. Overall it is a pretty solid choice for a stock grip. By now, many of you already know the deal with the Velo sound. If ping is your thing, then you certainly won’t be disappointed. As a whole, the Rawlings line has some of the loudest bats on the market. Their Acoustic Alloy and overall design helps contribute towards what is now such a well known sound. The bottom line is that you either love it or hate it, there isn’t much in between. Call me old school, but aside from the crack of a nice piece of lumber, it is really hard to beat the ping of the Velo. The 2018 Velo has a very low swing weight / MOI. It could be a great option for those players transitioning from -5 / -8 to the BBCOR -3. It is also a good pickup for hitters who really prefer a light swinging bat that they have precision control with. Overall the low MOI (moment of inertia) will allow players to generate more bat speed to transfer into the ball at impact, which is a good thing. It’s also important to understand that lower swing weights usually means thin barrel walls, which can result in low durability. Throughout the Velo’s tenure, it has kept a low MOI with the composite Comp Lite end cap along with good durability. A trade off to swinging a single piece aluminum bat is the vibration that you get in your hands on balls hit away from the sweet spot. While a lot of younger players have grown up only swinging composite bats, they don’t want anything to do with excessive feedback in their hands. On the flip side, many older and advanced hitters like and prefer a little more feedback from a bat to let them know exactly where impact was made on a given hit. That information allows a good hitter to make in-game adjustments on the fly with more confidence. The single piece aluminum Velo also provides a stiffer feel on impact in the “transition” area of the bat where deflection takes place. Some hitters prefer stiff while others like a little bit of flex, it all comes down to personal preference. Just like the 2017 Velo, the 2018 version performed pretty well in our testing. Rawlings uses what they call Precision Laser pOp 2.0, which creates a lasered groove through the barrel to create more flexibility and trampoline effect on impact. Realistically, when hitting I couldn’t feel any extra “flex” in the barrel on impact versus any other competitor aluminum barrel, but that’s not to say it isn’t happening. With the low swing weight, it is easy to get the barrel to the ball. If there is a negative about the Velo, it is the actual barrel length, which looks short. Unfortunately, that is a byproduct of creating an aluminum bat with a very low swing weight. Aluminum doesn’t offer the same adjustment opportunities as composite materials. Overall the Velo will be a solid choice for a lot of hitters. If you are looking for an single piece aluminum bat with a low MOI, it will always be in the conversation. Those who can handle a little higher swing weight, or those who enjoy a multi-piece or composite bat will be better served looking elsewhere. The performance is solid, but with a fairly short barrel it doesn’t allow for much wiggle room on mishits. Priced at $299.95 for BBCOR and $199.95 / $249.95 for Senior League, it will fall right in the middle of the spectrum. If you want to pick one up, you can shop them in -12, -10, -5, and -3 sizes.